Semi shade. woodland border. Attractive foliage. Hardy and reliable. Can be divided in early fall. Cut spent flowers to encourage reblooming. This is a native woodland species that will take a fairly shady spot. It reaches 2 feet and blooms from spring to early summer with clusters of bright blue cup-shaped flowers. The bloom period will be longest in a light shade with a moist soil. The ferny foliage remains attractive throughout the summer. 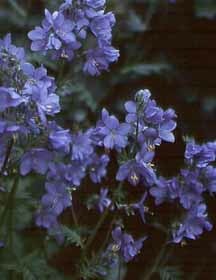 Jacob's Ladder is useful in mixed borders and wildflower gardens. New plants can be obtained by dividing established clumps or by letting plants self sow. Plants should be spaced 12 to 16 inches apart. Jacob's Ladder is a useful plant for the north or east side of the house where conditions are cool and only partially sunny. It is also a good choice for those who enjoy native species.